Matt Flinner exemplifies a certain quality that I have found in a lot of my favorite musicians but I've never quite been able to define it. He's relentlessly creative, never afraid to go in a new direction at the spur of the moment or to challenge himself in ways I would never think of. He also possesses a musical curiosity which helps him overcome boundaries. On top of that, he works as hard as anyone I've ever been around. I can't think of too many people who have toured and recorded playing lead mandolin in an electric rock-influenced band (The Matt Flinner Quartet), concertized with a string quartet playing his own compositions (he got his Bachelor of Music degree in composition from University of Utah studying with Morris Rosenzweig) and sat next to me making our way through the likes of Dvorak's 'American' String Quartet. And won the Winfield competition two years in a row on different instruments. And performed in a Mahler symphony and a Mozart opera, playing the mandolin serenade from Don Giovanni, (not singing). And performed with the Utah New Music Ensemble and with Leftover Salmon and Tim and Molly O'Brien. 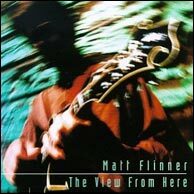 And led his own trio for years, The Matt Flinner Trio, in addition to playing with David Grier and Todd Phillips. And can remain his modest self and always fun to be around. Then there's his laid back style of existence and his dry wit which I take to be a reflection of his musical philosophy—be happy and interested in whatever situation you find yourself, and respond in whatever way you feel. Interact with your fellow musicians in ways that encourage creativity and take the thing where it needs to go. So I feel his voice should be heard, in music and words, and I'm glad to be able to say a few encouraging words about my friend Matt Flinner. Mandolin Cafe: You just returned from one of your Music du Jour trips. Share with our readers what makes this tour unique. Matt Flinner: So here's how it works: every day that we have a gig, each one of us writes one new tune (or more) to perform on that night's concert. The only "rule" is that you can't start writing your tune before the day of the show. After midnight the previous night is okay, since it's technically the same day, but we rarely if ever seem to start our tunes until the morning of the show. There are no other rules as far as style, difficulty, meter, length or even instrumentation, I suppose. It just has to be performed on that night's concert. For the the most recent tour, we had 10 shows in 11 days, all of which were du Jour shows except the last one (a 3:00 p.m. gig, so we didn't have as much time to write). Six straight days of shows, then a day off, then four straight days. It's a lot of hard work, so the days off in the middle are very welcome! 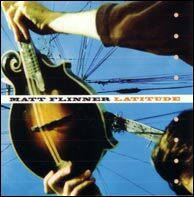 Matt Flinner Trio's Music du Jour. Click to purchase. I am always trying to become a better writer, and I feel that has happened since we started doing these. Mainly, I think we're just wanting to see where these gigs take us musically. Every day we each try to write something fresh, something different from everything else each of us has ever written. So we're always trying to push ourselves (and each other) into new and challenging musical territory and we've got a fairly diverse bunch of stuff stylistically. Bluegrass-flavored tunes, folky tunes, jazz tunes, chamber music sounding tunes, an occasional Latin-flavored tune, tunes in 7, tunes in 9, tunes in 5, etc., etc. But you're always trying to come up with something good, not something contrived, and hopefully the style fits the inspiration (and hopefully there IS inspiration in the first place). When we first stared doing this in 2006, I told the guys it was open to whatever we wanted to do. I said you could even put a fish tank on the front of the stage and have each us look at a fish and improvise. Thankfully, we haven't done that (at least not yet). Eric came fairly close to that one day when he was sort stuck for ideas. He blew a mouthful of blue corn chips onto a sheet of music paper and then assigned notes to some of the blotches, then wrote a piece around it he named Cumbia Maiz Azul, actually a pretty good tune in the end, as I remember. Eric is a guy who can make music out of many, many unexpected things. During the course of this interview, Matt learned some of our forum members had expressed an interest in his composition Half Moondog, which he has transcribed for us in standard notation and tab. Many of our tunes get forgotten after we perform them. Generally we've got to write and rehearse three more tunes the next day, and the day after that, and the day after that. Before you know it you've got 15 new tunes and can't remember past the last night's new ones. But we do at least have them all written down, and I've got them all (I hope) in a notebook. When we did our first CD, Music du Jour, we had written about 60 tunes on 20 gigs at that point. We went through what we thought were the best 15 or 20 tunes and then picked 12 that seemed to fit together well as a complete CD. Since then, we've done another 40 or so Music du Jour shows, for a total of around 120 more tunes. We've started going through them and will likely incorporate a bunch of them (I'm hoping about 15 or so) on the upcoming tour. And we're getting ready for another CD at some point next year. Might have to be a boxed set (here's where I add the little smiley face with the semi-colon and all that). I like what we've got—I have to say, when you've got 120 tunes to choose from, it's fairly easy to find 15 good ones. And the results of this "experiment" have been surprisingly good, even from the very beginning. We each definitely have our off-nights, but in general writing under this kind of pressure has produced some really good music for us IMHO. I'm as proud of the Music du Jour CD as I am of anything I've ever recorded as I think we pushed the possibilities out there a little for what is expected of a "bluegrass trio." And we created music that's not about hot solos or out-doing the latest attempt at out-doing. We created (again IMHO) good music, and I hope we've created something that people find to be moving in some way. Matt's comment: "My dad (Robert Flinner) and I used to do a bluegrass radio show on KRCL-FM in Salt Lake City from about 1982-1993 or so. My dad continued on for a few more years after that, and my brother Rex was also a frequent DJ on the show. The photo is probably from about 1985." Mandolin Cafe: Playing newly created tunes in front of a live audience must make for some interesting and unanticipated events. There's a wonderful YouTube clip of the trio performing Half Moondog at a house concert where a brief awkward moment provides some good laughs. Has performing in this type of setting on a regular basis changed how you approach your music on stage for regular gigs? Matt Flinner: Playing music that was written the day of the show has probably changed my attitude somewhat about performing in general. I think I'm open to things changing on the spot more than I used to be; in fact, I look forward to those unexpected things now. More and more I try to go into a show, no matter what the gig is, without any expectations of what will happen, how well it will go, etc. Every day is a different day, every venue is a different venue, every meal we eat the day of the show is not the same. So every performance is going to be different. And when you're playing with other musicians who are having their own unique experience of life that day on that stage, you've got that much more uniqueness at the gig. If I try to force any preconceived expectations onto the show, it almost always falls flat. So aside from writing a set list ahead of time (which often changes on the spot anyway), I try not to think ahead too much. Instead I tend to look forward to the unexpected and savor whatever happens. I think playing with David Grier and Todd Phillips has taught me a lot about how to approach music as well. Both of those guys really play in the moment, and always go for that fresh new spontaneous magical moment that you never see coming. I guess saying that that's something you "go for" or try for doesn't really make sense. If you try for it, you never actually get it. Instead, you provide the opportunity for it to happen and you make the most of it when it does. David especially will deliberately not play something the way he played it the night before, but instead will try fresh avenues every night to see where they take him. I think his attitude is that repeating an idea that originally happened spontaneously takes the spontaneity out of it, and you can hear the difference—it can come across as stiff, or that you're trying too hard. So he's constantly looking for that next bit of magic that comes unexpectedly. And then he moves on. When you have something that clicks between the three of you, that's even more special. I might add here that I want to avoid giving the impression that I feel it's good to go into a gig unprepared. There is a big difference between unprepared and, let's say, unattached. The more you've practiced the material, figured out how you'd approach the chord changes, learned the melody, etc., the more prepared you are at performance time to just "go with it." I have to say, there are a few du Jour gigs where I wish we'd had more rehearsal time. I love the challenge of playing the new stuff, but the more time I've had to get it under my fingers, the better. Our very first du Jour show was a pretty educational experience in that regard. Eric Thorin, our bassist, had written a tune in 9/8, in which you count the beats in various groups of twos and threes—not something second nature to most of us (like me)! It was a great tune (one we may even record some day), but the performance was as close to a train wreck as we've ever come. We got through it, though pretty battered and bruised. But we've learned that since part of Music du Jour is the performance, you want to write something that's going to be playable without a ton of rehearsal; but you also want to finish your tune in time to get a good rehearsal in. We definitely don't shy away from trying to challenge each other, but you sort of walk a fine line in your writing between difficulty and playability. We've also become better (or at least I certainly have) at sight reading and at memorizing quickly. So I think it's easier to push each other further and further as we get better at the performance aspect of the shows. The View From Here - 1998. Click to purchase. Mandolin Cafe: Music du Jour tours follow a path through the West where you grew up and at places you've played at many times. That must be fun to go back and visit and gig at your old haunts and see new and old friends. Matt Flinner: I like doing most of our du Jour tours out West for many reasons. It's where Eric and I both grew up (Eric still lives in the Denver area), and Ross spent 10 years in Denver and still has many, many friends the area. So it's where we seem to have established ourselves the most. The familiarity of the crowds, the open-mindedness in general, and of course the beautiful scenery always help put us in a good mood. Plus, I love snow. I have a brother and sister in Salt Lake City, so I try to get out there a few times a year to see them and let them spend time with my two boys, Lucas and Teagan. And, Utah still feels like home to me. My first musical experiences came in Salt Lake as well. My older brother Rex taught me to play the banjo when I was 10, and then got me started on the mandolin soon after. He and I had a band (the original Matt Flinner Trio—I think the novelty of having a 12 year old with a couple of other guys was a big part of it) and would play for tips in Trolley Square, a rustic old shopping area. Then we moved on to pizza joints, clubs, wherever else we could make a few bucks and not be told to play more Neil Young or Bob Dylan covers. When I was 12 I also joined a band called the Peewee Pickers, which was a bunch of kids ranging in ago from about 10 to 15, and was run by an energetic guy named Ted Shupe (his son Ryan, our fiddler, is pretty well known in the West). One of the greatest things about being in that band was getting to go back east to play bluegrass festivals for a few summers in the early 80s. It was the first time I got to see some of my heroes: the Osborne Brothers, Ralph Stanley, the Country Gentlemen, J.D. Crowe, Doyle Lawson & Quicksilver, and on and on. At a few of these festivals, it was just one after the other and I couldn't believe it. Peewee Pickers, circa 1982-83. L-R: Wil Hales, Ted Shupe (tuning his son's fiddle), Ron Child, Ryan Shupe, Carl Bullock and Matt Flinner. Mandolin Cafe: You had (or still have) a role in the Modern Mandolin Quartet some may not be aware of. 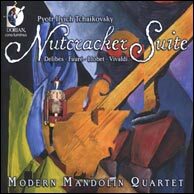 Modern Mandolin Quartet, Nutcracker Suite, re-released in 2010. Click to purchase. Matt Flinner: The group had pretty much stopped performing but I just found out we are back at it as of this coming summer. We'll be doing some gigs on the West Coast in July and then recording a CD of American (or American-related) classical music later in the summer. I'm very excited! I joined them initially in about 2002 and we did a handful of tours and a recording, The Nutcracker Suite, which has just been re-issued. It's actually a re-recording of that piece the original configuration of the Modern Mandolin Quartet did years earlier, plus some other pieces. They taught me a lot about classical performance and brought some great music into my life. It was always an intense musical experience for me, and a lot of fun. Dana Rath, Paul Binkley and Adam Roszkiewicz (and previously Gyan Riley) are all wonderful guys and really fun to play and hang out with. You can still check out our performance of a Villa-Lobos piece and a few others on You Tube. Mandolin Cafe: Tell us more about your current band-mates Ross Martin (guitar) and Eric Thorin (bass). Matt Flinner: On one of those Peewee Picker tours I remember asking Eddie Stubbs (fiddler for the Johnson Mountain Boys at the time) what it took to make a band work. He said, "Well, the first thing is that you've all got to be good friends." That surprised me at the time, but over time I began to get it, that friendship in a band is at least as important as musicianship. These days for me I think it's probably 75/25 in favor of friendship, as the journey you take together musically is so much more fun and ultimately productive when you enjoy the down time on the road together as well. I feel incredibly privileged to have Ross Martin and Eric Thorin as my friends and musical cohorts. Both of them are top-notch musicians and they both bring a lot of passion and musicality to their playing every night. We all met through banjoist Tony Furtado, as we all were in a band with him at various times (Sugarbeat for me in the early 90s, and the Tony Furtado Band for Ross and Eric, in the mid to late 90s). I met both Ross and Eric when I sat in with Tony's band at various times while we were all living in the West (Ross and Eric around Denver, me in Jackson Hole, WY at the time). And Ross, Eric and I first decided to start touring regularly as a trio in late 2006. Both of them have long resumes, but besides the MFT, Eric most recently has been playing with Brother Mule (with Ben Winship), Mollie O'Brien (whose latest CD he and Ben brilliantly co-produced) and Abigail Washburn, as well as his old bluegrass band, Open Road. And Ross has been most recently playing with Jayme Stone, Bearfoot, Mollie O'Brien, and jazz trumpet great Ron Miles. Eric still lives in the Denver area; Ross is in New York City now, and I am in Nashville. We usually get together for a couple of weeks at a time to tour and hang out. I always look forward to the challenge of playing with both of them, and always come away inspired and wanting to work harder and figure out just what the hell they were playing on the last tour. Plus they're just two of the nicest guys I know, and are basically part of my family at this point ("Uncle Ross" and "Uncle Eric" to my boys). Matt Flinner on banjo touring with the Drew Emmitt Band in 2004. Matt won the Walnut Valley National Banjo Competition in Winfield, Kansas in 1990 and returned the following year winning the mandolin contest. Mandolin Cafe: You played a big part in Steve Martin's banjo recording The Crow. Matt Flinner: I was very honored to be part of Steve Martin's The Crow CD. I got the call from Tony Trischka, who pretty much put the backup band together. On most of the tracks, the band is comprised of Steve, of course, on banjo, Russ Barenberg on guitar, Brittany Haas on fiddle, Skip Ward on bass and myself on mandolin. Michael Daves also stepped in on guitar on the final day of recording. Tony had been working with Steve sort of as a banjo consultant, I think, a while before recording of The Crow had started. And he actually had Steve record the tune The Crow on his own Double Banjo Extravaganza a year or two earlier. Tony brought a relaxed vibe to the recording, as well as some killer banjo playing on a cut or two. I have to say it was a very special experience for me to get to be part of that recording. The vibe was wonderful, the tunes were really good, and Steve was the nicest, humblest guy you could imagine. And he took the project very seriously. He was there to play the banjo and get it done right. People generally ask me if he was funny in person. I don't think he was there to be funny, but rather to play the banjo (I'm not going to get into whether or not that is a contradiction). He was extremely warm, generous and fun to be around. And occasionally funny, too. Latitude, from 2000. Click to purchase. Mandolin Cafe: What's the story behind your marvelous sounding Gilchrist? Matt Flinner: My mandolin is a Gilchrist Model 5 made in 1993. I waited about 9 months for it before I received it (my wife Wendy half-jokes that it is my "other" child). This was back when Dexter Johnson and David Grisman were the exclusive dealers of these mandos. I was touring in the Bay Area at the time that the mandolin was ready, so I went over to David's house in Mill Valley, CA to pick it up one afternoon. David happened to have Jerry Garcia over at the house that day working on the Not Just For Kids CD. So I got to shake David's AND Jerry's hands AND get my new mandolin all in the same day. Pretty cool for a 24-year old kid! David has always been one of my mandolin heroes, and he's also always been really friendly and encouraging to me. My mandolin is X-braced, and I think it had the same character from day one that it has now. I'm sure the sound has evolved and aged some over time, but it had the same deep and open sound right from the beginning. Also, it is slightly deeper than most mandolins, by 1/16 to 1/8". I don't know why Steven Gilchrist did this on my mando (I've seen maybe a couple of others of his that had the same extra depth), but I'm sure that has something to do with the depth of the low end on it. It's also got a one-piece back. I feel like Steven really blessed me with a mandolin that has some unique characteristics to it that I love. It's a mandolin that my playing has had to grow into, as can be the case with many new instruments. I'm not quite fully there yet, but getting closer, and I love that ongoing process of getting to know the instrument over time, even after 17 years. Mandolin Cafe: Working with the Modern Mandolin Quartet, Nashville Mandolin Ensemble and as author of a number of publications, you obviously have some serious theory knowledge. Matt Flinner: I played piano as a kid but largely forgot how to read music as a teenager when I was focused on the banjo (and later mandolin). I wanted to study music theory and composition in college, so my reading ability had to catch up at that point. I've never been a great sight reader, but regular playing with the MMQ and lately with my trio helps it a lot. In pretty much all cases I'm more comfortable if I've got the music memorized; with the MMQ there's such a large repertoire that I rarely have much completely memorized, but I try to get as close as I can with all of it and just use the music as a little crutch. Mandolin Cafe: Tell us about your transcription work. Matt Flinner: I use Finale for notation on the computer and have authored or co-authored a number of books that have done quite well. I just recently finished a huge project for Hal Leonard: The Real Bluegrass Book. This is a 300+ song book of bluegrass standards and modern bluegrass songs and instrumentals, and is written in the style of the original jazz Real Book. I'm quite proud of that project, as I think it will be the best and most extensive notated collection of bluegrass songs out there, at least as far as I'm aware. It will be available in the next couple of months. My next project is a book of my own tunes from various CDs I've done over the last 12 years or so. It should be out by the summer. Mandolin Cafe: You're working as a sideman with a lot of different groups playing a lot of different kinds of music. 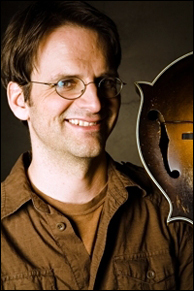 Matt Flinner: Besides my trio, I do occasional gigs and tours with Darrell Scott (mandolin and banjo with him), Frank Vignola, David Grier, Alison Brown, Missy Raines, and the Ballinger Family Band with Ethan Ballinger (I also play some banjo with them), among others. And I do play with the Nashville Mandolin Ensemble when they have a gig, lately about twice a year. I met Butch when Weary Hearts came to Salt Lake City, either in the late 80s or early 90s. When I moved to Nashville ten years ago, he was very encouraging and was as helpful as anyone in helping me get gigs (he might be the reason I'm in the MMQ). I'm hoping that a collection of modern classical-style pieces he put together will get released some time. It includes a mandolin duo he and I recorded written by Tully Cathey called Journeys. A really interesting collection of pieces. Matt with the Frank Vignola "Gypsy Grass" Group. L-R: Rich Zukor, Matt Flinner, Frank Vignola, Vinny Raniolo, Pete Coco and Casey Driessen, taken in St. Louis in 2007. Microphones: in studio, either Neumann KM 85s (I have a pair I often bring with me) or KM 84s or KM 184s. Live: the Neumanns can work in some situations, but otherwise I like the AKG C-1000 or a good old Shure SM 57. Just wanted to say thanks for the great music and inspiration! I caught Matt's most recent Music Du Jour show in SLC recently, and it was a great night of music. A reminder to me that if they can write (and perform) good tunes every day, I should be able to turn out a least something more than once a year! I had a chance to play a *tiny* bit with Matt at a house concert in Park City, UT a couple years ago (he joined us for one tune) -- and though I'm sure he doesn't remember it, it was a chance for me to meet one of my musical inspirations and something I'll always remember. It's silly, but I can say I traded fours with Matt Flinner. If you haven't heard him, then you owe it to yourself to get out and do so. Thank you so much Mandolincafe and Matt. What a great interview with one of my favourite mandolin players. Thanks also for the TAB of 'Halfmoon Dog'. What a fantastic tune. A video performance clip can be found on Youtube to make learning the piece a little easier. I just wish that Matt could be encouraged to star on an instructional/motivational DVD produced by the likes of Homespun or AcuTab. Great player, great guy, great interview, thanks! Great interview. I really enjoyed it. I love the little clips of them playing. Shows how Great a player he really is. Thanks! What a great interview! I bought Matt's All Star Bluegrass Jam for Mandolin. As a beginning mandolinist with years of guitar playing under my belt, this book-CD combo was a perfect fit for my needs. I am looking forward to hearing more of Matt's music. MF creates melodies that are so memorable yet fresh and non-cheesy. My favorite living composer. Thanks for the interview. What I'm excited to see is the completed Real Bluegrass Fakebook Matt's finishing up, that should be great and I never heard about it until this interview. Excellent interview. Matt's one of my favorite mandolin players. His compositions are top-notch and he plays with a feeling that's both relaxed and intense at the same time. I'm glad to have seen him perform nearby on several occasions. Great interview. Anyone who listens to Matt knows how immensely talented he is. His technique is precise and his musical range is really quite something. A listen to Latitudes with electric quartet will surprise those who mostly know his acoustic work. What isn't as obvious is his discipline. You don't get this good on talent alone. He puts a lot of dedication into both his playing and his composing. I had the pleasure of taking a master class with him, and I recommend it to anyone who has the chance. I learned a lot about discipline in 90 minutes--now if I only had the time to apply some of that knowledge. The Music du Jour project shows a really remarkable sense of disciplined craft that Matt, Eric, and Ross all collaborate on. There may be others out there, but I can't think of any another musician who challenges him or herself in the way that they do with the Music du Jour project. It takes me weeks to frame an idea for a tune, and it's sometimes months before the band gets around to it, and weeks more before we have a handle on it. So I'm in awe of the way that Matt, Ross, and Eric challenge themselves and the beautiful results they produce. Brilliant interview! Big thanks to Matt and the Cafe. I second that- Matt's master class is the best I've ever taken; the handouts are so good that I wish there was a whole method book. He's just a cool, relaxed dude, too. Nice. Can't wait for his book of tunes to come out. I spent a lot of time on New Cimarron, fingers crossed that it's included! Matt comes to Santa Cruz (CA) around every other year or so, both for giving some lessons and doing concerts. He and those with him, have played some great music here. Interesting and inspiring interview. Thanks, Matt, for giving us lots to think about. "Saw the trio perform last night for $5 at Jack of the Woods; fantastic show! Great interview, with well thought out answers. Matt is fantastic! I was there, too. Didn't make it in until around 10.00pm so I missed most of the first set. Sorry I didn't pick your face out the crowd or I'd have said hello. Absolutely love Matt Flinner's genius and his 2003 recording of "Walking on the Moon," still gets frequent rotation in my CD players, though I'm trying to get over how much his picture on the Cafe Front Page resembles Dwight Schrute from "The Office." Great interview of a highly underrated artist. Matt's mandolin playing is a wonderful and refreshing break from the ordinary. What a brave and unique way to avoid the mundane with "The Music of the Day" approach to a set list. A truly amazingly talented and resourceful Trio. Again my hat is off to Scott and the Cafe for this caliber of content. 10 years ago today we published a Bill Graham article about Matt entitled Flinner's Made Fresh Daily. So long ago we didn't at that time have the capability of allowing comments on news items. Still a good read. Noting the anniversary of this interview with Matt we did back in 2011. Observing the anniversary of this fine interview with Matt. Took some lessons from Matt at Ashokan last October. Great guy. A real artist. Purchased one of his "Trio" CD's and it's still playing on the Random CD player in my SUV.